MamaBreak: Bungee is Keeping Dad's Gear Safe for Father's Day! Bungee is Keeping Dad's Gear Safe for Father's Day! Have you ever lost something that was really valuable? Maybe it was your favorite pair of sunglasses, or even worse-- your phone. 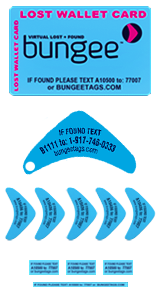 We were thrilled to receive Bungee tags for review, and think they are the perfect solution to lost items! Bungee tags are small "stickers" that identify your item, not with your name or phone number, with an ID number. With that ID number, the person that has found your item can text to the Bungee number, which will alert you that your item was found, so that you can retrieve it! For only $10 you can get a packet of Bungee tags (with everything seen below) and the service for 1 year. For only $25 you get lifetime service plus new tags every year! $25 for such an amazing piece of mind! MamaBreak received bungee tags for review here on MamaBreak. We did not receive any other type of compensation. As always, our experiences and opinions are our own.